bag-athon. Together, in community, we will knit new relationships, sew reusable bags for our community and our love of place! We hope you can join us for an hour or the the whole day! Chester Creek Cafe, Whole Foods Co-op, Joann Fabric, Duluth Grill, Duluth Folk School, McTavish Quilting Studio, Adeline, Inc., and Hannah Johnson Fabrics & Sewing Studio. Join us in observance of Earth Day to produce reusable bags to be given away at grocery stores and around the community at a later date! Fabric and thread will be provided for those who would like to participate, most spaces will have spare sewing machines, however, bringing your own equipment is encouraged! Finished bags can be dropped off at McTavish Quilting 1831 E. 8th Street, Duluth, MN 55802. Sewing hours: 10am-8pm, drop-ins welcome as there is plenty of space! 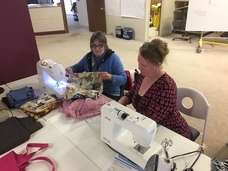 If you would like to set up your own sewing team we have other spaces to be utilized. Or if you have your own location and would like to invite others, please let us know and we'll add your site to this list. Email us and we'll get right back! There are literally hundreds of reusable bag patterns on the internet. We are suggesting this pattern as a good, simple, design. Perhaps the most important consideration is strong handles! Loop them under the bag or double and triple sew to the bag. Many people like a flat bottom, so that the bag can better accomodate boxes. The pattern above includes a flat bottom. but, if the design is to difficult feel free to use whatever pattern you can find, as long as it has strong handles! !